All horse owners dream of the beautiful, long and thick flowing tail on their companion, however not all genetics allow this to happen without human intervention. Horse tails become thin from broken hairs that catch on items or from brushing them to remove tangles. When you braid your horse's tail and add a tail bag, it keeps his tail clean and prevents breakage to promote a thick, luxurious appendage. Making your own tail bag involves little time and cost. 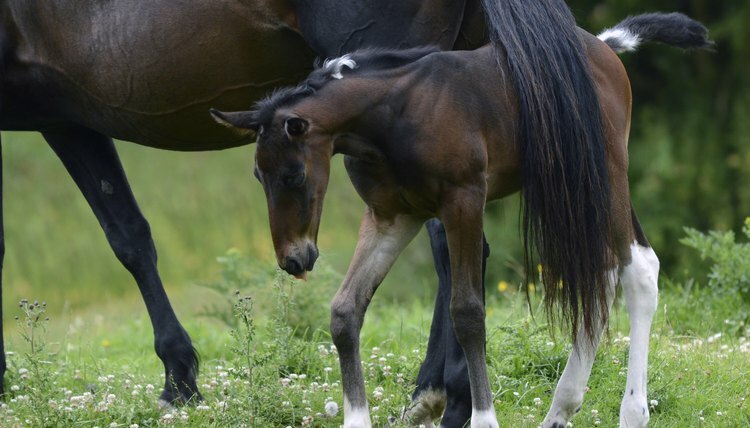 Brush out your horse's tail to remove any tangles and debris. Place the tip of a measuring tape on the bottom of his tailbone and measure to the bottom tip of his tail. Subtract 3 inches from the measurement. When his tail is in a braid it will be shorter than when it is unbraided. Lay a piece of Lycra material flat on a table with the right side down. Use a ruler and pen to mark a rectangle that is the tail length minus 3 inches in length and 10 inches wide. Cut along the lines with scissors. Fold the material in half with right sides facing each other along the length of the tail bag. Insert the bottom of the tail bag into a sewing machine, stitch forward about 1 inch, reverse the direction to sew over the inch, and place it in the forward sewing direction. This is a locking stitch used at the beginning and end of a sewing project. Sew forward across the bottom of the tail bag, and then turn the material to sew up the length of the tail bag where the two cut edges are folded together. Repeat the locking stitch on the last 1 inch of the tail bag's length at the top. Cut off the excess thread. Turn the tail bag inside out with the right side facing outward. Cut two pieces of hook and loop tape, one of the hook side, and one of the loop side, to 5 inches long. Sew one of the two pieces at the top of the bag on the seam and the other directly across from it on the opposite side of the tail bag top with the smooth sides facing outward. Lycra is a stretchy material that holds a horse's tail in place in the tail bag. Hook and loop tape holds the tail bag on better than tying strings in a bow after inserting one end of the tape through the top braid and fastening it. Lycra material and hook and loop tape are available at fabric shops. If you don't have a sewing machine you can hand-stitch the tail bag with a simple straight stitch.